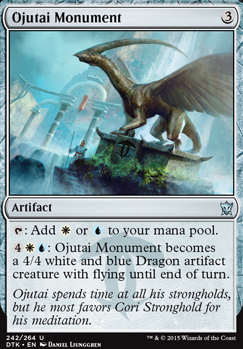 : Ojutai Monument becomes a 4/4 white and blue Dragon artifact creature with flying until end of turn. I would replace the Ojutai Monument with the Azorius Locket I've always had poor luck with the monuments especially in the late game and the draw can just be far better in a pinch. Heya Fans, and welcome back to our show. After some practice with our potential new hires we come to our first look at what fresh acts we can bring to the audiences. After much hiring and firing, then rehiring again, and many hours of choreography, I am happy to report we have had decent results. And that I'm convinced there could be physical changes made. If you disagree or think of something better, please share your thoughts in the comments. Mage-Ring Network - City of Brass : You might be thinking "Why CoB?" Dissipation Field and Landfall triggers is why. End Hostilities - Supreme Verdict : One mana less, and unstoppable. Fumigate - Cleansing Nova : Having choices is always better. Disperse - Unsubstantiate : Not quite a counterspell but at least we know what'll be in their hand. Rewind - Lay Bare : Theme fitting, like cost. 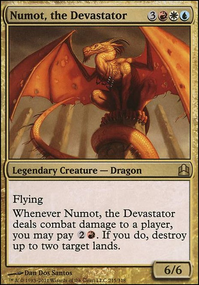 Dragonlord Ojutai - Dream Eater : Smaller beater, better effect. Overwhelming Denial - Dissipate : Needs more testing to be sold. No big change really. Angel of Condemnation - Admonition Angel : We lose the reactive ability, but I see this being a useful tool for clearing blockers, and for political plays. These changes aren't so deck altering as some of the others I am still considering, but I'm still not 100% on them. Need some outside input. Wandering Eye or Fog Bank - Ingenious Thief : Eye gives away our own information, Fog does nothing against trample. Thief however can be blinked and doesn't pose a large threat stats wise. Hanna, Ship's Navigator - ??? : Closest things I could find that flies is Razor Hippogriff , Sanctum Gargoyle , and Griffin Dreamfinder but that only covers half. Or is this ability really necessary, can we work around our toys being removed and use this spot to fit something new?. Azorius Keyrune & Ojutai Monument : for lack of a better word they seem 'cute' now. They seemed useful at first because they turned into flying creatures that shared the benefit other flyers do. Better rocks? Keep? Replacements could include Fellwar Stone , Basalt Monolith could be blinked with Brago... unsure what else is good and not overly expensive. Favorable Winds : Is it really necessary, amid the other +'s it seems the least shiny, even though it's foiled. Stay tuned for more to come! We're always trying to keep fresh acts, and as accidents happen replacement performers will hopefully be swift coming. Don't forget the suggestion and vote box on your way out. See you next time at The Circus! Sol Ring -> Azorius Keyrune: Taking out Sol Ring bc it's oppressive. Kind of a soft ban. 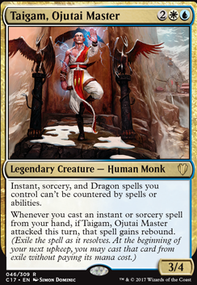 Azorius Cluestone -> Ojutai Monument: Having a 4/4 dragon available is better than a single card draw when we have mana to burn. Mana Vault -> Basalt Monolith: moving towards 3 drop ramp to synergize with Trophy Mage. Auramancer -> Ironclad Slayer: Auramancer may technically have more targets, but the slayer hits our 3 hexproof/shroud equipment, which is more valuable than most of the non-aura enchantments. Plus Sun Titan gets many if not all of them back as well. Wingmate Roc -> Keeper of Keys: Roc conceptually has good value, but it relies on Raid. Keeper provides card draw as well as mass evasion for finishing. 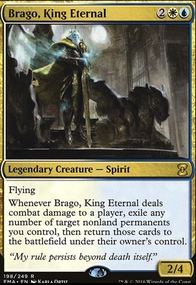 Ugin's Insight -> Recurring Insight: originally replaced with Trial of Knowledge and while that card is good, I wanted non-etb card draw effects in case of Torpor Orb or similar etb hate. 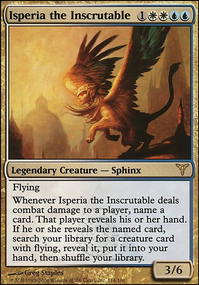 Lens of Clarity doesn't really do anything, and Sphinx's Tutelage/Altar of the Brood has such a low chance at doing something that you might as well not run them. Ojutai Monument isn't great either since you don't really ramp towards anything. I guess you could do Anticipate > 3-drop, which is fine, but not something you'll be going every game. Graceblade Artisan is also very low impact when you only have Glaring Aegis to support it. Glaring Aegis itself isn't very good if you aren't trying to win the game fast. 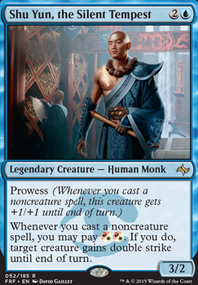 Ojutai's Command is fine, but it's really asking for some 2 drops. Wall of Omens is good at grinding. I think Ojutai, Soul of Winter Would be amazing in this type of deck. If you need ways to speed it up, try Sol Ring and possibly Thran Dynamo, Ojutai Monument, and Silumgar Monument.